Super 8 is a film that arrived with a lot of hype upon its June release in the States due to the secrecy of the marketing campaign and the producing/directing partnership of Steven Spielberg and JJ Abrams. It’s August now and European audiences are finally seeing what all the fuss is about. Super 8’s protagonist is Joe, a pre teen living in Ohio whose mother dies due to a workplace accident. Struggling to cope with this loss, him and his father have a less than fulfilling relationship, giving Joe more time to help his friend make a zombie movie for a film festival. While out after hours however their masterpiece is halted by an event straight out of the movies, which will change their town and their lives forever. Super 8 is a love letter to those who love film and more specifically those who love the films of Steven Spielberg. 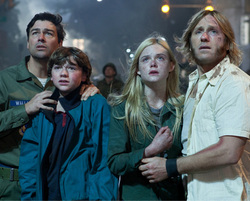 A lot has already been said and written about how closely Super 8 resembles E.T and Close Encounters of the Third Kind. However despite this heavily referential tone, JJ Abrams brings his own style to the film in the form of lens flare and a Cloverfield esque monster mystery. While Mission Impossible 3 and Star Trek were both great filmmaking achievements on both a technical and narrative level, Super 8 is JJ Abrams best and most personal film to date. In Super 8, JJ Abrams captures the triumph and terror of filmmaking and life in a way that I have not seen for a long time, if ever. The greatest triumph of his direction in this film is the way in which the story is told visually. The opening shot of the film tells us that a tragic loss has occurred and does so not with dialogue but via imagery and music. The cinematography in this film is also fantastic and Abrams brings this small Ohio town to cinematic life. The films action sequences are all impressively helmed with the train crash sequence being so much more effective than the bombastic barrage of Transformers: Dark of the Moon. Like Spielberg’s Jaws, Abrams looks to build tension by not revealing the force of nature behind many of the films mysterious happenings until the third act. Some of the tension and moments of terror that Abrams delivers in this film, really pushes its family friendly rating to the limit. This is however a summer blockbuster that refreshingly does not rely on action sequences to keep you thoroughly engaged for its running time. The relationship between the children and their movie making escapades are so fun to watch that you could sit through and enjoy the film if that is all there was to it. Infact the films first act which focuses heavily on the children and their encounters of a realistic kind is arguably the films finest hour, portraying either the childhood you had or the childhood you wish you had. The reason why these children are so fun to watch is down to the fantastic performances from Joel Courtney, Elle Fanning, Riley Griffiths, Ryan Lee, Gabriel Basso and Zach Mills. The two-standout performances however come from Joel Courtney and Elle Fanning who provide the best on screen romance of the year. Joel Courtney is instantly relatable and likable in the lead role of Joe. He is the heart of the entire film and superbly pulls off all the emotional aspects of the character. This kid is one to look out for in the future as if he can keep delivering performances as believable as this one, then he is a future Hollywood star in the making. Meanwhile Elle Fanning gives what I believe to be the best supporting actress performance of the year so far. As Alice she is Joe’s kindred spirit and the moments the two of them share a scene together, are moments when the film really soars. A scene where the two of them watch footage of Joe’s mum leads to a teary, emotionally charged monologue from Alice, which genuinely gripped and moved me. Another aspect of the film that provides it with a lot of emotion is the original score by Michael Giacchino, which is right up there in the pantheon of John Williams and deserves an Academy Award nomination. The piece titled “Letting Go” which closes the film is a wonderful piece of music, which perfectly accompanies the final scene and I have not been able to stop listening to it since returning from the cinema. As for the late seventies, early eighties soundtrack and the film in general for that matter, they had me at ELO. While the secretive promotional material and the viral marketing campaign would have you believe this is akin to Cloverfield, this is a very different film. Cloverfield provides much more of a visceral, thrilling impact than the more emotionally based Super 8, which is Yin to Cloverfield’s Yang. A large amount of hype for this film like Cloverfield has stemmed from the presence of an unseen, mysterious monster and it is in this section of the narrative where Super 8 is strangely at its weakest. The explanation of the monster, what it is, why its here and what its doing is rather disappointing and hugely ineffective. The main reason this reveal lacks a significant punch is because unlike the rest of the film it is not told through the visual and instead we are treated to some expository dialogue. If we were supposed to emotionally connect to this alien then we needed to actually see what it was that caused all of this rather than be told it by somebody. The back-story and explanation is not weak in itself but is weak in its execution. Another aspect of the creature that many (Including myself) find or may find disappointing is the design. This alien like the ones in Cowboys and Aliens have a very unmemorable design and look to them, and while you may argue that the Cloverfield monster had a forgettable design yet that monster is effective, that is because that creature was not given an emotionally charged back-story and oddly enough Super 8 could have benefited by like Cloverfield not revealing too much about the who, where, when and why regarding the monster. However for me personally, this anticlimax around the creature was not a big concern while watching the film and is still not a huge concern after it. The reason for this is because the story and the emotion regarding the human characters was so believable and so well done that I was too invested in that to let it bother me. Ultimately by the films conclusion it is the human story that we are meant to feel emotion for, not the aliens and therefore I think it was a misstep to try and provide the alien with an emotional background that was unnecessary. Putting the problems with the alien and the unoriginality to one side, Super 8 is a beautifully filmed, well-acted, exciting and moving summer blockbuster that defines the term heart warming. I could go on to write about the multiple nuances and scenes that stay etched in my memory and I cannot wait to kick start my summer next year by watching this wonderful film. While I do not know how the film will fare on multiple viewings, as of right now this film edges X-Men: First Class to become my favourite film of 2011 so far. Summary: A charming ode to the terrors and joy of life and filmmaking. Disagree with this review? Give us all your thoughts in the Your Say section.